BING WILL BE AT THE SHELTER ON SATURDAY FROM 12-3 PM! COME MEET HIM! Bing is 8 yrs young and weighs just a smidge over 17 lbs. Because of his ongoing medical issues, we are looking to place him locally. He’s super sweet, affectionate, gentle, very calm and laid back and loves to just hang out -- his favorite place to nap is in the laundry basket. He loves people. He’s good with dogs and we think he would be good with cats - but he definitely prefers to interact with people. 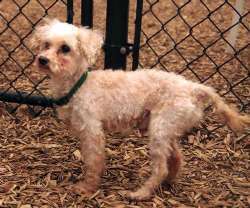 Bing came from a hoarding situation in Houston where the owner passed away and the family surrendered him. We think Bing has the potential to be a therapy dog. He’s good with kids. His foster Mom had a 20 yr old autistic son with down’s syndrome (age equivalent of 3 yr old) and Bing just LOVED him. He’s housebroken and crate trained. We prefer a quiet household for him, however. He enjoys car rides. He’s good being bathed and groomed. He does have dry eye (common in shih-tzus) which requires eye drops 2x a day but he’s very good about getting drops put in and being handled. Do you have room in your life for this sweet little fella? If so, do not email us but hurry over to our web site to fill out the online application at http://saveadog.org/applytoadopt.asp. He is available on 1/10/17. UPDATE: He was seen by the vet and he appears to be blind in his right eye and impaired in the left. He also appears to be hard of hearing, but can hear a squeaky so the jury is still out on that one. 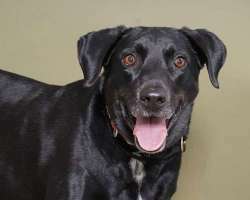 Hi there, My name is Bozey and I'm a five year old Black Lab mix. I'm friendly and an easy keeper. I love to go for a walk or sit by your feet watching TV. I am from Georgia and I spent most of my life living outside either on a chain or in a pen. My meals consisted of scraps. A kind woman took pity on me and took me for walks every day. Eventually she was able to convince the owners to give him up. I would do best in an adult home as I'm a big boy. No cats for me, please. Lab experience or large breed experience would be great. I promise I will be a good boy in your home. I'm already crate trained. You can change my name. Bobo or Boo Boo would be a lot better. My foster mom says I'm a good boy, and I love people and love attention. I'm housebroken, know "sit, stay and come" commands. 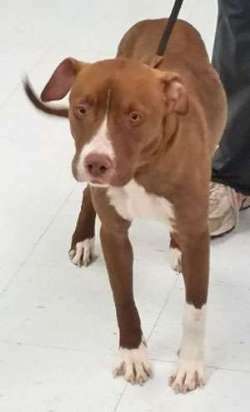 I'm very treat motivated, walk well on a leash, and am happy to meet other dogs, male and female, may then pull on leash only because I want to play with them. Bozey can be a little mouthy if you're trying to put socks on but can be easily redirected with a ball or squeaky toy. He is an active boy and plays like a big puppy. Bozey crates nicely and will sleep all night in the crate. He is a real sweetie who just wants to be loved." 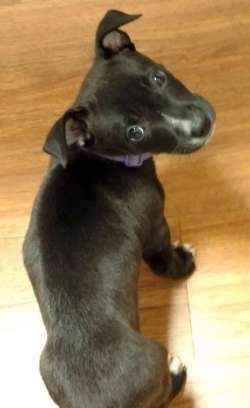 Hi, My name is Burgundy and I'm an 8 week old pup looking for my forever home. Please be someone who is home or who has multiple responsible adult members who are home to care for me. I'm too young for daycare or a mid-day dog walker. 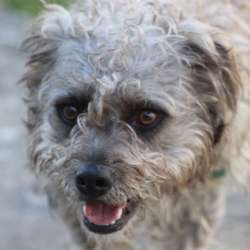 If you're interested in adopting me please fill out an online application at http://saveadog.org/application.asp Thank you! 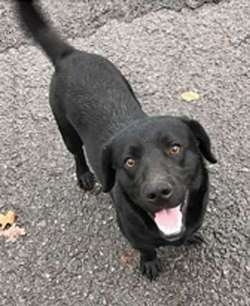 Buster is a neutered male black lab/basset mix. He is 10 months old and weighs 35 lbs. He is fine with all over handling. Great with kids!! He had some wounds on his back leg that the vet thought was bite marks. He's almost housetrained - down to one accident in the house a day, staying in a crate at night with no problem. Buster was in a house with 3 children, ages 8, 11, and 14. He adores the kids, especially the 8 year old girl. He acts like a rag doll around her letting her dress him up, lay on him, and play. There are 2 other dogs in the house and he loves to play with them. When the other dogs growl, he walks away and show no aggression. We've not had him around cats. He is full of energy and loves to run in the yard with the kids. Buster Video being handled: https://youtu.be/7kxZ2Ky2LYc Buster Video with kids: https://youtu.be/e9UMqjFJ5Tc Please apply online. He will be available around 1/3/17. Hi there, My name is Buster and I'm a sweet boy. 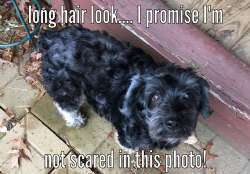 I'm a 7 year old Schnauzer-Poodle mix and I weigh 19 lbs. I was rescued from an animal hoarder. 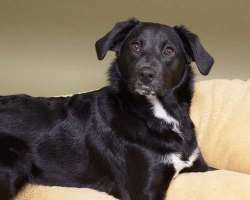 I'm good with other dogs because I lived with lots of them and I have an easy-going temperament. I am already neutered. I will need to be on a healthy diet and will need a dental but my teeth were not as bad as the other dogs who came from the same home. I would be an easy first-time dog for someone. I was not raised with children so visiting kids might be okay, but Save A Dog would rather I not live with kids because of the unknown history with children. I'm available now. 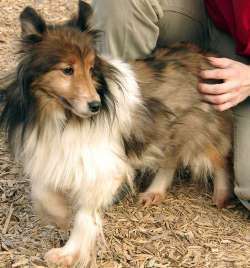 Corky is an 8 year old spayed female Sheltie who was turned in by her owner along with a group of other dogs. She will need dental work including extractions. She needs to go with another small dog preferably a male as she's very shy right now so needs a confident dog to show her the ropes. We are looking for an experienced adopter who can give her the TLC she needs and who will extend her life with holistic care and nutritious food. Hi, My name is Darby and I'm a one year old fuzzy dog with short legs. 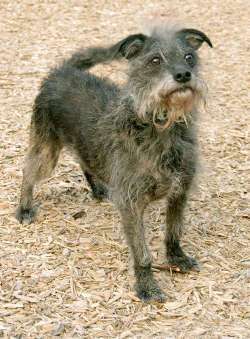 They think I'm either Schnauzer or wire-haired Dachshund. I'm definitely a mix. I weigh 14.5 lbs. 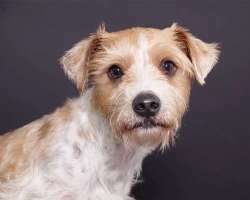 I’m about 2-3 yrs old and some sort of russell terrier or Dachshund mix. I’m very sweet, affectionate, friendly and outgoing. I love my foster mom’s 4 yr old granddaughter - she can even coax me to sing back to her like my husky foster brother does. I am very smart – when you say ”kennel” I’ll jump right in. I am crate trained but will still need some help to become 100% housebroken. I love to play with other dogs – even the big ones! I am not sure about cats as they were in another area but I wasn’t too interested. I have a medium energy level, I love to play but I like to relax too. I’d love to have a family of mine own – could that be yours? I'll be available on 1/10/17. Hi there, My name is Dusty and i am looking for my forever home. I will be a big boy so i need a large fenced in yard to run around in. I need someone who can be home with me during the day. Your application will help to speed the process. Foster mother in St. Thomas reports that he is the most mellow puppy - very sweet. He has gone to work with her almost every day and is very socialized. He adores children and would follow them around. He gets along vey well with other dogs. He just likes to eat and sleep with brief spurts of play in between. 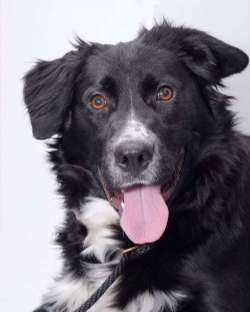 Hi there, My name is Ella and I'm a one year old spayed female Collie / Australian Shepherd mix. I weigh 41 lbs, I'm fine with other dogs and people too. I had too much energy for my last owner so you'll need to have an exercise plan. I'll be available around January 3rd, 2017. Please apply online if you're interested in meeting me. Foxy is ADORABLE! She is Corgi-sized and just wants to be your pal. She's about 4 years old, perfect for a single or a retiree or a couple. She will sit by the fire or go for a walk. She's an easy keeper. 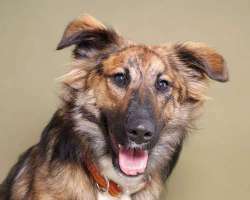 She was originally adopted from the St. Croix Shelter as a puppy, and returned recently. The only reason they gave is that they could no longer care for her. I think she may have been an only dog. They had her in a foster home over a long weekend and she did really well with the foster mom's little dog. Although nothing ever happened, foster mom felt she was a little too interested in her cat. Then the foster had to go off island so she didn't get to explore that further. Foxy LOVED the Shelter cat, but really wanted to chase another feral cat that showed up a couple weeks ago. So I guess it will depend on the cat whether she could go to a home with cats. Her usual playmate at the Shelter was a boxer mix, but she was afraid of two other big dogs so it will depend on proper introductions. 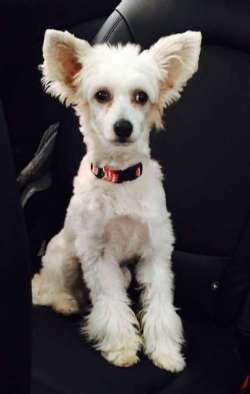 She's currently in a foster home with small dogs and she loves to give them kisses. She is available now and won't be here long once everyone sees how cute and lovable she is. Save A Dog is located at 604 Boston Post Road in Sudbury MA. 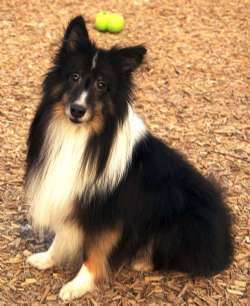 Isaac is a six year old male Sheltie who came from a hoarding situation. He has lived with many animals, but was not well cared for so he needs good nutrition and a holistic-minded adopter. A quiet home is preferred. He has no history with children. He will need TLC upon arrival but if he passes the vet exam we will show hiim on Sat, 1/21. 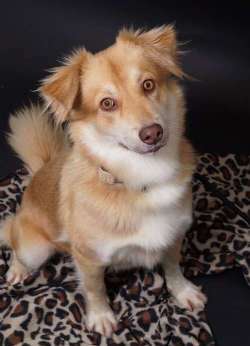 Jade is a spayed female 1 year old Collie/Corgi mix who came from St. Thomas. She is a low rider with a Retriever personality. She's mild in temperament. She was found hanging around a federal facility and then was brought to shelter. She will want to be with her people, so a stay at home or young retiree would be great. She likes to play and rides well in the car. We are a small shelter and private appointments are limited to those who fill out the online application at http://saveadog.org/applytoadopt.asp. Please check the Web site for drop in hours as well. Hi there, My name is JoJo and I was rescued from a hoarder who finally gave up when he became overwhelmed. Needless to say, I didn't get the good food or dental care that dogs need so I need some TLC -- and some sponsors too. I will be available to meet on 1/21/17. When I came into Save A Dog I was very matted, but a volunteer groomer clipped me down and now they know that I am neutered. I will want to sleep under the covers with you. I'm not one for children or full time workers. I will need regular grooming and dentals. Please apply online and come during our meet and greet hours. Don't forget to bring the family and any dogs you want me to meet. Hi! My name is Kady and I'm an exuberant and playful girl. I'm full of puppy energy so I'm looking for an adopter who can give me plenty of exercise and outdoor time -- leash walking won't be enough. Playing with another Lab would be my cup of tea. A fenced in yard will help with my exercise needs but I can't be left outside alone or I will dig out. I like to chase after toys in the yard and chase a ball. When I see another dog I get so excited and happy. I'm a very sweet and super smart girl who loves to work for treats. I'm sill working on jumping when I get excited so I'd prefer a home with teens and up. I love everyone I meet and everyone is greeted with a tail wag. If you want to come visit me at the shelter please fill out an application online. Can't wait to see you! 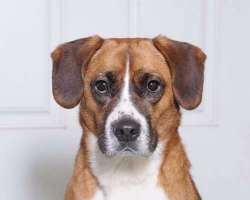 Lucy is a 2 year old spayed female mix who weighs 23 lbs. She has a Boxer face and markings and short legs like a Basset or Corgi. She was rescued in Indiana and lived on a farm with lots of other dogs. 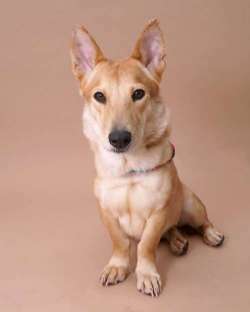 But she got adopted and the household took in another female Corgi too close in age and size so fights broke out and Lucy has lost her home. She hated the crate but they crated her to keep her safe from the other dog so she developed anxiety. Medication did not help and made her more anxious, especially around crates and gates. A holistic-minded home would be a dream for her as she needs calm energy in her new home and homeopathic remedies which we know work better than pharmaceuticals. Lucy is an old soul and so soft and gentle. She loves her people and would be okay alone for a couple hours as you get her acclimated to your home. 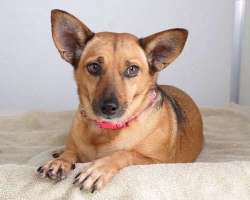 She would do best with an adopter who has dog experience. We just don't want to take a chance of having her lose her home again so we will place her as only dog. She can probably eventually live with a male dog. Lucy has a lot to offer. She loves long walks and loves to ride in the car. She rides nicely in the back seat. She is a people lover and is house trained and good on leash. She likes her people close by or she gets anxious. She is not destructive, though. She loves cuddling and belly rubs. 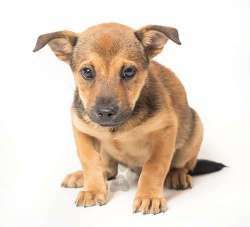 Hi, My name is Molly Brown and I'm a ten week old female Corgi mix. 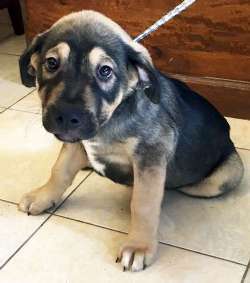 I just flew in from the Virgin Islands and I'm looking for my forever home. Please be a stay-at-home. If you have kids, I need a fenced in yard attached to the house. I'm already spayed so will need supplements to help me finish growing properly. Please apply online before coming to visit me as it helps the meeting to go faster. Can't wait to meet you! Hi I’m Otter. I’m approximately a year old and weigh about 13 lbs. I am SUPER sweet and I LOVE to give kisses and cuddle on the couch. I also sleep in the bed with my foster family. I love to play with other dogs and with kids too but I have not been tested with cats. I am easy to pick up and bathe. I shed a little so I’m not hypo-allergenic. I’m crate trained but I am still working on house training – I need someone to be consistent with me. Do you have room on your couch for me? 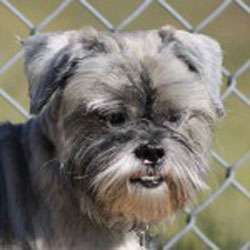 Save A Dog says, "Otter is one of our "Save Our Scruffies" from TX. We're fund raising for Otter and a few others as it will cost approximately $500 per dog just to get them here and then they have more expenses on our end. Please help us save these cute pups! He’s about 1 year old and 10 lbs (if that even). He is HW negative and ready to go to his new home. Very friendly little dude with people and other dogs. All dogs receive their core vaccines and are neutered if mature. From then on we advise you to be careful with vaccines, especially with the little ones as you can seriously harm their little immune systems with some of these vaccines. 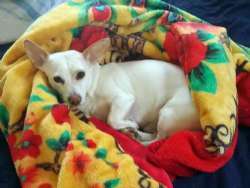 Applicants, please be holistic minded to ensure that your dog has a long and healthy life." Percy is my name and loving is my game. I love to hug and give kisses. I am 9 months old and weigh 15 lbs. I am a Chinese Crested Powder puff – a very special breed. I love to get dressed up in clothes and strut my stuff. I love to go for walks but need a harness because I pull a little and will choke/ gag with just a collar. I’m not a barker EXCEPT at moving cars – I bark at them and want to chase them. If you have a fenced in yard and there is a weak spot in a fence I may try to escape so I need a very secure yard and to be supervised. 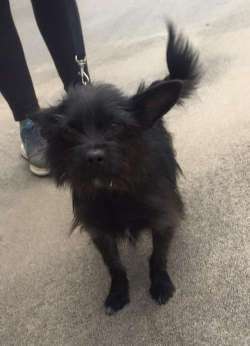 I would really love another active small dog to play with or an active family as I am energetic and really like to run & play with other small dogs. I am crate trained and am almost housebroken. I have some food allergies and I will need high quality grain free food and freeze dried or raw otherwise my eyes get really red and I sneeze a lot. I have been around a cat but was kept separate but I am VERY interested - so not sure. I love kids but have only been around older kids 10+ but I am so sweet, loving and gentle that I’m sure I will be fine with little ones too. We may have a home for Percy, but feel free to apply as a back-up. Available 1/14/17. Hi, My name is Petey and my owner lost her home and had to give me up. I lived a charmed live up until then. She was very sad and I'm sad and confused. I was very well loved and was raised with kids. I'm frightened but I will come around. I'm trained on leash and won't get into your stuff. I'm neutered now but I caught kennel cough at the vet hospital so I will be available as soon as I'm no longer contagious. I hope someone will give me a chance and love me or even foster me until my Mom finds a home again. I'm a VERY SWEET boy. 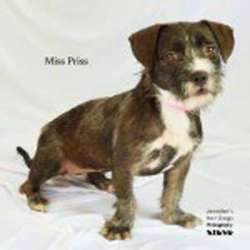 Prissy "Miss Priss" is a 1 year old mixed breed (Boston Terrier / Schnauzer?) who weighs about 35 lbs. She LOVES everyone she meets, dogs included, and is house trained and crate trained. She is a total love bucket. She has a family waiting, but needs to meet the adopter's dog, so it could fall through so we're posting her in case it doesn't work out. Here's some more information about Prissy: I am Potty trained, but please assume I’m not for the first week. It was very confusing for me at the beginning. I will sit next to the door outside when I need to go and will go right away or use command “go potty”. Crate trained - I’ll sleep through the night in my bed though, ideally next to my human but I’m totally fine in my crate too. I do love to snuggle if you'll let me. Commands I know: sit, leave it, drop it, go potty and am working on “come”. I am still working on all of these with more distractions. Bad Habits: I like to chew so please give me appropriate toys for that and I promise I wont chew your nice things (I love my elk antlers). I like to eat the little pieces of plush toys so watch me during toy time! I’m very curious! I get along with all dogs and people. I play very nice with my foster brother and love to snuggle with my foster sister. I love to meet new humans! Please let me say hi to as many people as possible!! It makes my whole body wag! Grooming - I just need a bath now and then when I get stinky rolling in the grass. I shed a bit but it’s barely noticeable. I’m still wriggly for nails and teeth but I’m learning to be patient. I am leash trained but sometimes I get a little too excited and will pull. Please keep working with me to walk nice on a leash all the time. I love the water!! I jumped right into the ocean for some swim time without a second thought my first time at the beach. I like to chase and pounce at the little waves. Puffy came from a hoarder and is in rough shape. He is at the vet hospital now and they are making him comfortable, but he will need many teeth extractions, plus grooming to free him from the prison of his coat. He's going to need a lot of TLC and an adopter with a big heart. We are trying to find a dental appointment for him asap. PUFFY FOUND A COUPLE OF VERY LOVING ADOPTERS SO HE HAS FOUND HIS HOME. THANK YOU, EVERYBODY! Reese is a sweet female chocolate Lab/Bully or Boxer mix who is 1.5 yrs and weighs 46 lbs. Very sweet. Fine or scared of other dogs, not alpha at all. She's been starved. The pound found her dumped near their facility last week in the cold. She was digging under the police impoundment building in an attempt to find someplace warm. She's had puppies recently but they are no where to be found. Fine with all over handling. Fine on a leash. Let's get someone who's going to spoil her rotten. She needs Princess status from here on out. Hi there, My name is Rusty and i am looking for my forever home. I will be a big boy so i need a large fenced in yard to run around in. I need someone who can be home with me during the day. Your application will help to speed the process. 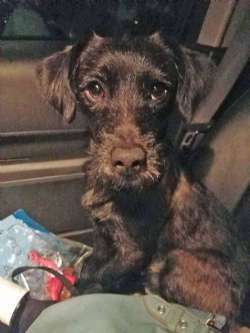 Foster in St. Thomas reported that he went to work with her almost every day and he is very well-socialized and outgoing. Loves other dogs and children. He also loves to snuggle, and also loves to explore. Hi there, My name is Sandy and I was rescued from a hoarder who finally gave up when he became overwhelmed. Needless to say, I didn't get the good food or dental care that Chihuahuas need so I need some TLC -- and some sponsors too. I will be available to meet on 1/21/17 but will have my spay surgery and dental on 1/25 and can go home after I recover. I will want to sleep under the covers with you. I weigh a whopping 5.6 lbs so no small children. Please apply online and come during our meet and greet hours. Don't forget to bring the family and any dogs you want me to meet. Hi there! 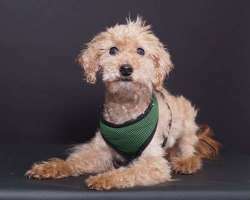 My name is Taco and I am a 2 year old Poodle / Wheaton mix. I am quite a character! I even come with a story about my name. I was found at a construction site in Texas, where some nice people would bring me tacos during their lunch. I am now on a diet that is much better for my belly and I weight a smidge under 30lbs. I can be strong on leash so need a strong handler. I am very friendly and get along well with other dogs. I have lots of energy and have a ball running around outside, but my favorite place to be is cuddling in someone's lap. I am also a big kisser so be prepared! 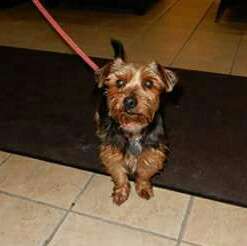 If you think that I would be a good fit for you please go to saveadog.org and fill out our online application. Hope to see you soon! Hello there! My name is Topaz and I'm a gorgeous 3 year old Corgi girl. My previous owner didn't have enough time for me, so I'm looking for an adopter that can give me the attention I deserve. I can be a little shy when I first meet you, but I bond quickly and love to play. I'm very affectionate and love to be close to my people. Sometimes I will nibble on my people when I'm really excited. I'm gentle, but not everyone appreciates it. I wasn't raised with kids, so living with them would be overwhelming but visiting children would be fine. I can't wait to meet you, so please fill out an online application and set up an appointment to come right away! Toro and his son Southpaw were turned in at a shelter in TX due to lack of finances on the part of the owner. Toro is 3 years and weighs 17 lbs. Both are friendly and good around other dogs. Toro thinks he can take on big dogs though, which is typical of a Yorkie. Otherwise, he is easy to handle, groom and should be good with visiting kids too. He is HW negative and ready for a home. It will cost Save A Dog approximately $500 each to rescue them, so donations are greatly appreciated. How do you feel about squirrels? I like to chase them away! I also enjoy going for walks, riding in the car and sleeping at your feet (under the covers, please.) I'm a charming good boy and smart too. Not only am I housebroken but I'm a good sport about going out if it's raining or snowing too. Nobody's perfect though... my weakness is chasing cats and that's why I'm looking for a new home. I've been cohabitating with a female dog without any issue. I am sure to learn routines in my new home in a flash! Notice my gorgeous hair? It will require regular grooming. My photos show my "long hair" and "just groomed" looks. You may notice my left eye is a little cloudy. It doesn't stop me from living a full life though. If you've got room in your life for a low-maintenance little man please apply to apply for me. Perhaps we can start 2017 together!